The subject is taken from Shakespeare's 'Two Gentlemen of Verona', Act V, Scene IV. 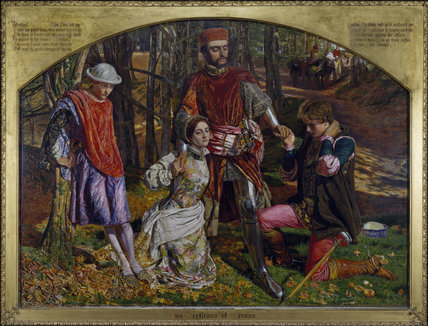 From left to right: Julia disguised as a page, Sylvia, the appeasing Valentine and a repentent Proteus who is in love with Julia. Sylvia's father, the Duke of Milain, with a group of followers can be seen in the right background. Hunt began to paint this landscape in Knole Park, Sevenoaks, after which he began to work on the figures in his studio. Sylvia was modelled by Elizabeth Siddal, Proteus by James Aspinal a lawyer and friend of Hunt, Valentine by James Lennox Hannay, a young barrister. The related oil sketch is in the Makins Collection. Oil on canvas, framed, with arched top. Purchased by Birmingham Museum and Art Gallery, 1887.